How much influence does tobacco have in research? 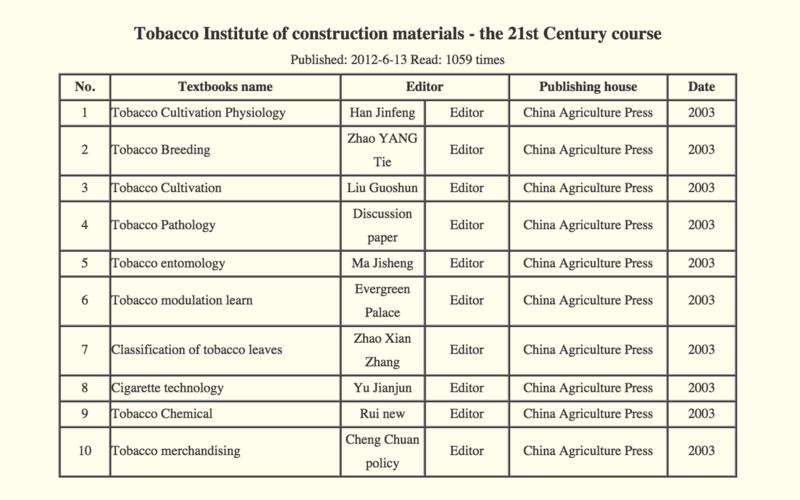 The China's tobacco monopoly has created dozens of research and educational programs all over China. Click map to expand, and sort research institutions by date of establishment. How long has Big Tobacco had this much control? Timeline of tobacco's influence in research over the years. Click to access! Hover over images to learn more! The images below are screenshots of university & research institute websites. Home of the first tobacco major, created with help by the China National Tobacco Corporation in 1975. China's largest government owned tobacco research institute, where Xie Jianping is deputy head. The institute is funded and controlled by the China National Tobacco Corporation. The tobacco training center is a "school" that teaches skills used in tobacco related careers. Note that this is also operated by the China National Tobacco Corporation.